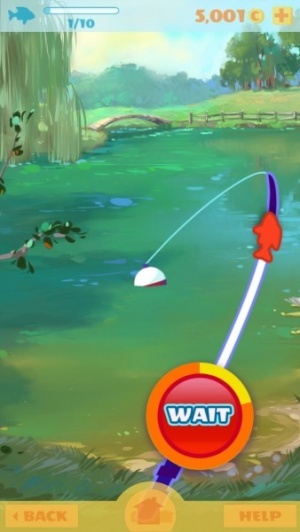 Build up a fishipedia with this simple to play and quite satisfying casual fishing game. Fishing has never really appealed to me. It looks cold and wet, and a bit too slow going for my liking. Fortunately gaming has the collecting side of it covered. If fishing were like Fishton, I'd be pretty happy. Mostly because I'd be indoors and waiting to catch fish really wouldn't take that long. A distinctly casual affair, Fishton isn't going to challenge anyone, really. It succeeds on a basic level, captivating players by giving them plenty of reason to seek out new fish. Basically it's all about collecting as many fish as possible and watching as one's log steadily builds up with successful catches. Jobs are available too, giving players some reason to try to pursue particular types of fish. Actually fishing is pretty simply done. Tap on the screen when the lure twitches, then hold down a green button when it appears, and release it when it turns red. It only takes a brief time to catch anything with a mixture of fish and random collectibles popping up every now and then. 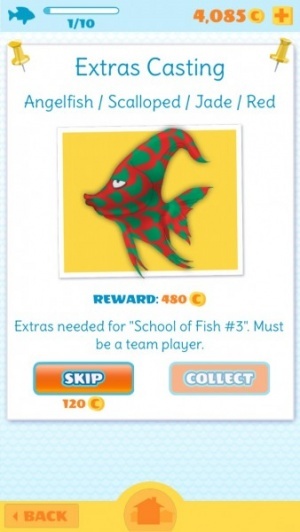 Once caught, said fish can either go in the player's Fishipedia or it can be sold for money towards new bait. It's also possible to breed fish; creating new and often slightly outlandish varieties. Timers are involved here, but otherwise players are pretty free to play as and when they wish. Admittedly, a purchasing structure for in-game items is a tad stingy with some items bound to take a very long time to earn. However, the core experience of Fishton is easily accessible for free. Fishing in Fishton is relaxing stuff, and it's reassuring to be able to achieve something in a relatively short space of time. Graphically, Fishton is a little rough around the edges but after a time that matters less so. Instead, the sheer fun that can be gained from chasing after just one more fish keeps one interested, even if it is a relatively shallow concept focused on grinding.